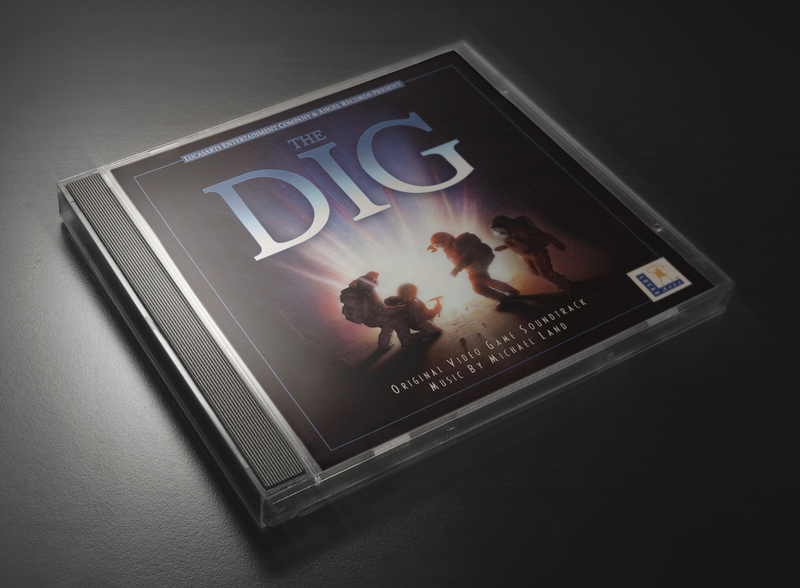 One of my earliest game memories – and still one of the best – was Lucas Arts’ The Dig. I remember getting this for my 15th birthday. Just unpacking that box with its polychromatic finish shimmering in all colours was downright amazing. I had a friend staying over that night and we played through the whole game until 3 or 4 in the morning. Not without help in form of a printed walkthrough of course (no internet back then, kiddies! ), but it was totally worth it. A film-like experience I still have fond memories of… even now, twenty years later. I always wanted to remake the original album art (#1) of Angel Records’ official release, omitting all unnecessary elements and save it in a high enough quality to make it palatable for contemporary tastes. Based on the largest key art I could find (which still featured four astronauts instead of the latter three), I combined elements from both the old game box art and its jewel case cover. I’ve probably spent the most time on the remade logo and its colour gradients. And the final result is very near to the CD case I was holding in my hands as a kid, when I finally picked up the score from the only store in town that was able to order it for me from overseas. The second cover (#2) is based on a hypothetical movie poster created by American artist Steven Chorney. The game was initially planned as a science fiction vehicle directed by Steven Spielberg (imagine early 90’s John Williams tackling The Dig… damn! ), but due to budgetary reasons it eventually ended up at Lucas Arts. But to be honest, I’m actually glad it did, because it provided me with one of the most magical and wonderful gaming experiences of my childhood. Beautiful enhanced and redesigned covers for The DIG. I too am very fond of this classic LucasArts game and love the score (and own it). I’m going to use one of your cover as the cover image for my digital copy.